Tawfiq al Hakim - Who is Tawfiq al Hakim? Who is Tawfiq al Hakim? Tawfiq al-Hakim was born in Alexandria in 1898, the son of a wealthy Egyptian judge. He studied law and literature in Cairo, graduating in 1925, and then continued his studies in law in Paris. Following his return from France, he worked as a deputy prosecutor in Alexandria, combining his legal work with writing. In 1929, he transferred to the civil courts and worked in other cities, including Tanta, Damanhour and Dessouk. He came to know the rural life in Egypt through working as a public prosecutor in the provinces. Tawfiq al-Hakim worked as a journalist in Akhbar al-Yom, at the Ministry of Education, and as a manager of the Egyptian National Library. In 1933 he wrote a novel titled Awdat al ruh (the Return of the Spirit) which reflects his thoughts on social problems and his nationalist feelings. In 1936 his Yawmiyat Na’ib fil Aryaf (Diary of a Country Prosecutor) was published, a satirical novel about peasant life – the primitive conditions under which they live and the abuse they suffer from those in power. By 1938 he decided to devote himself completely to writing. Usfur min al Sharq (Bird of the East) is the forerunner to several other novels about persons from the East experiencing life in the West. His works were influenced by European literary movements, particularly symbolism, realism and surrealism. The play Ya tali’ ash Shagara (the Tree climber) translated by Denys Johnson- Davies is in the manner of the Theater of the Absurd. Some of his early works deal with the problems facing the educated Arab who returns to his country from the West. His works have been translated into English, French, Italian and Russian, and have been adapted for broadcast radio in the West. Although he wrote novels, poems and essays, Tawfiq al-Hakim is best remembered as a prolific playwright who played a key role in the development of Arabic drama. His output covers fifty volumes. 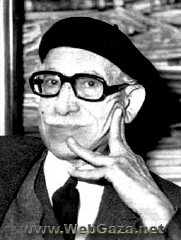 Tawfiq al-Hakim died in 1987.